Electric drive cars, lorries, motorcycles, aeroplanes, bicycles and boats – and now motorhomes – the world of transportation and leisure is changing with Victron Energy being a natural part of this revolution. Exhibiting at Caravan Salon Düsseldorf 2017 until Sunday September 3rd is the new concept motorhome by Dethleffs (called the e.home) which utilises Victron Energy products inside for the e.home domestic services. Setting up the Victron Energy stand in readiness for the show. 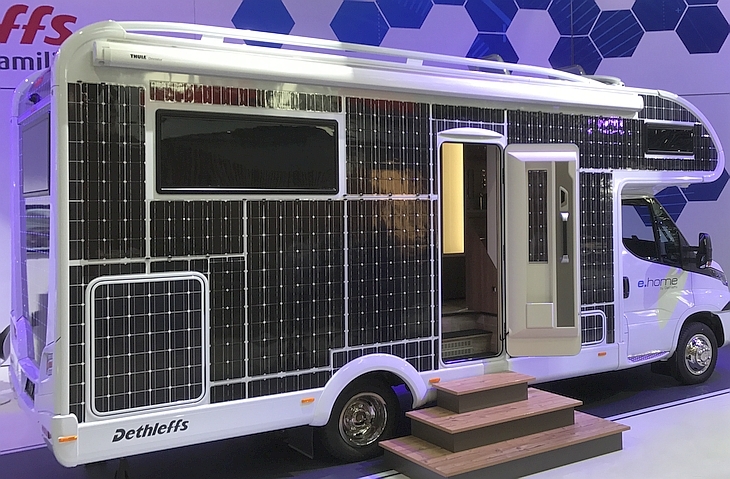 Dethleffs are the first well-known motorhome manufacturer to present a concept study of a fully-electrically driven motorhome. Their developers are convinced, stating that: “Electric drive for motorhomes will play a great role in the future even if the implementation won’t be as quick as in the car sector”. This is why they are actively facing up to the concept of ‘Electric Mobility’ by creating the e.home study vehicle. For this reason it is important to be a pioneer in this sector, as Dethleffs Managing Director Alexander Leopold explains. 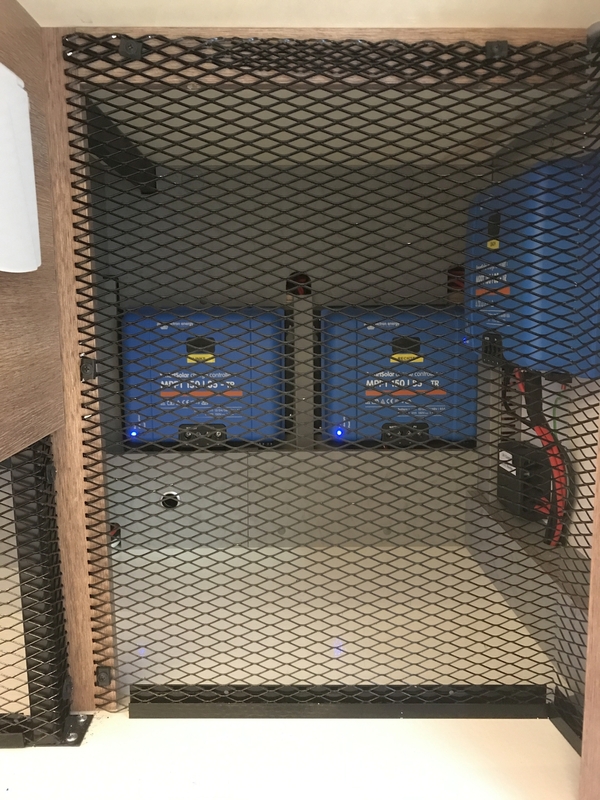 The e.home is based on the Iveco Daily Electric chassis with a liquid-cooled three-phase AC motor with a power of 80kW, utilising modern FIAMM Sodium Nickel Chloride batteries with a capacity of 3 x 76 Ah at 400 V. These can be recharged up to 1,500 times equating to a mileage of circa 250,000 km. Of particular interest are the special installed ‘Supercaps’. These high-power capacitors allow a faster recharge and delivery of the electrical energy in comparison to the usual batteries – and so increase the performance of the vehicle as well as the lifecycle of the batteries apparently. When operating the vehicle using electricity (for driving and living) the harvesting of solar energy becomes ever more important. For usage in a motorhome that requires high specification photovoltaics. 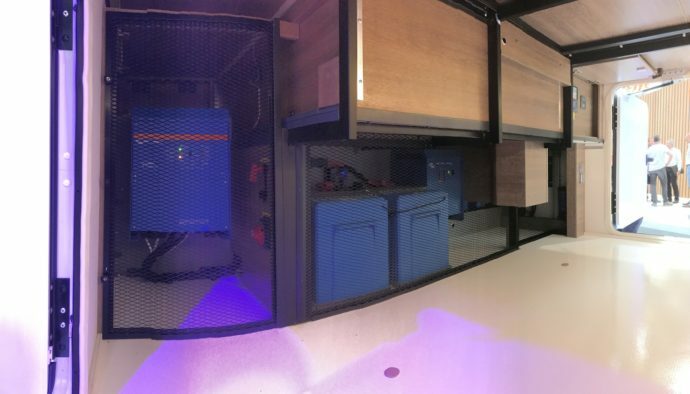 The Dethleffs e.home is equipped with 31 square metres of modern and optimised thin layer solar cells, giving around 3,000 Watts of peak power. Victron Energy system components for the Dethleffs e.home are shown and detailed below. Solar charge controllers to harvest all that solar energy. A combined inverter/charger for onboard AC electricity and the charging of the Lithium domestic power storage batteries. Required ancillaries which include battery safety protection, system monitoring and the e.home heating power supply. Not forgetting a DC-DC converter to ensure all those 12V, USB accessories, tablets, smartphones etc., can be supplied and charged! Heating is often the most energy intensive use of energy in a motorhome. When changing to an electric heating system it was mandatory that the Dethleffs developers find a new, even unconventional solution to generate a pleasant warm feeling with as little energy use as possible. To achieve this a number of latent heat accumulator plates made of PMC (phase change material) were installed in several places. The heat accumulators absorb energy at temperatures over 26 degrees and deliver it when the temperature goes down in the evening hours. Additionally heating elements are also mounted in the floor, sidewalls and furniture which then heat the interior via infrared warmth sources, but only the objects they reach – not the air. This is efficient yet still creates a cosy warm feeling, although the general room temperature is at 2-3 degrees lower than with traditional heating systems. Infrared warmth though is available without any pre-heating time. A ceramic stove with three cooking hobs as well as an energy efficient compressor fridge are installed in the e.home. In looking to the future of motorhomes Dethleffs installed some technologies to increase comfort and the quality of life. Amongst these is a special foil technology which can be used as a mirror and when switched on it spreads a bright, planar light. Another interesting feature is the electric window blind. This is a foil, that is set between the window panes of the insulated windows, which can be electrically dimmed as a protection from the sun and intense heat, as well as being able to be used as privacy screen too. Dethleffs place great importance when it comes to connectivity. Smart homes and the internet of things (loT) are fast evolving trends of the present, which are having more and more impact, offering new possibilities for comfort and safety. 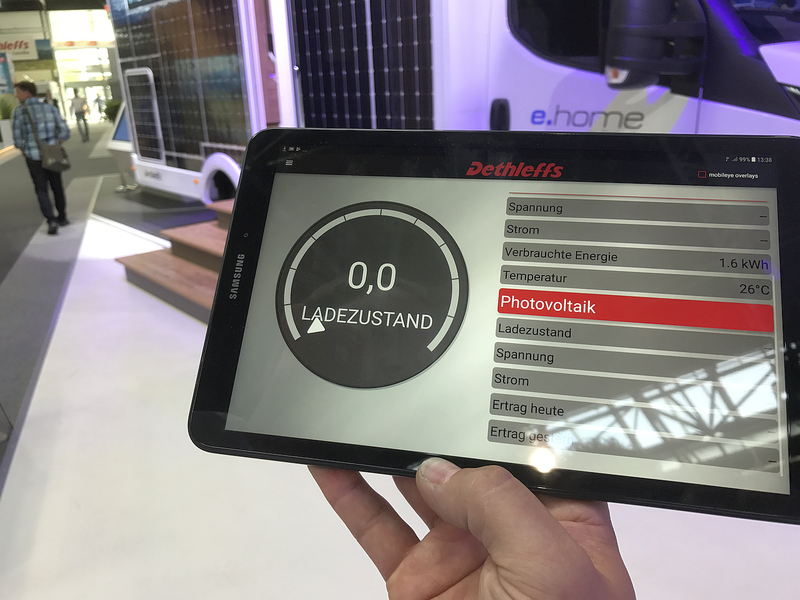 The basic prerequisite for the ‘Smart Motorhome’ therefore is the digitisation and connection of the installed components in the vehicle. 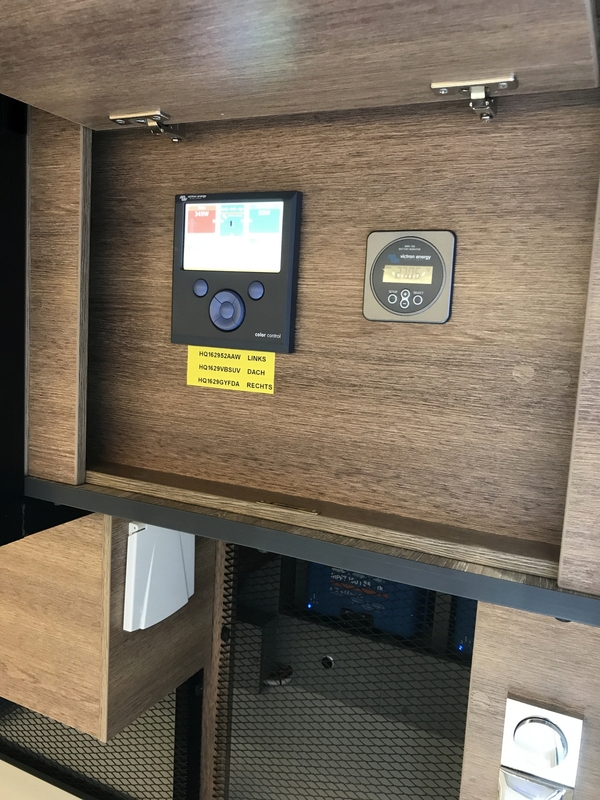 The Dethleffs e.home has an integrated system installed called CampConnect, which enables connectivity of general components and is able to digitalise almost all components in the motorhome. This connectivity can be operated by an installed app on your tablet. The operation and display possibilities are there for heating, light and power as well as central locking. Dethleffs have installed an innovative safety system in the e.home. This so called ‘Mobileye’ supports the driver in the form of a ‘Third Eye’ in order to keep track of situations in front of the vehicle. It identifies potential dangers on the road and forewarns the driver by acoustic and optical signals. It’s great to see pioneering projects choosing and using Victron Energy products. We wish Dethleffs every success for their e.home project and look forward to hearing more as the system evolves. 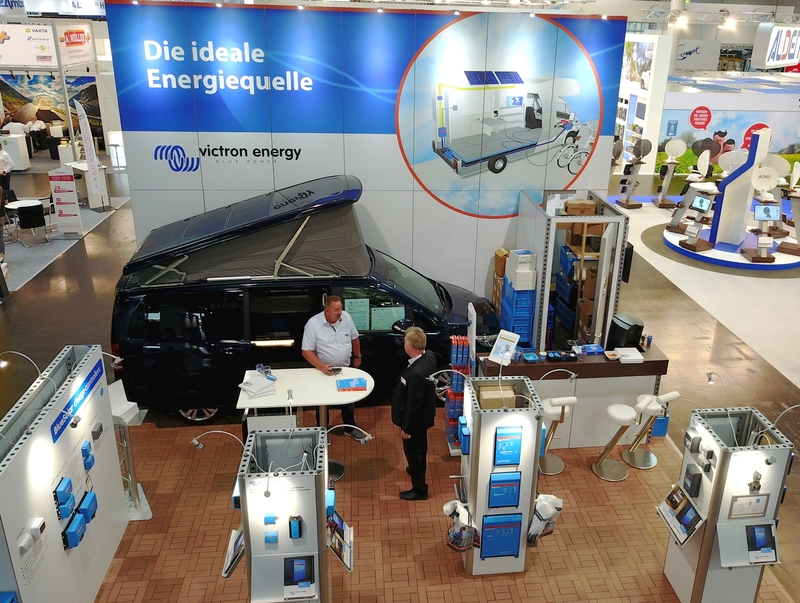 We hope readers get a chance to visit Caravan Salon Düsseldorf 2017; if not I trust this blog gives you an insight into Victron Energy’s products and how they can be integrated into exciting projects such as the e.home. Thanks to Dethleffs staff and Uwe Dräger of Victron Energy for the information and images used in this blog. With the invention of the first caravan in Germany – called ‘Wohnauto’ – the company founder Arist Dethleffs laid the foundation of caravanning in Germany. Today the Dethleffs GmbH & Co. KG with its site in Isny in the Allgäu is the largest manufacturer of motorhomes in Europe. In one of the most modern production facilities about 1,000 employees manufacture up to 10.500 motorhomes and caravans per year. With annual sales in the amount of about 314 million EURO Dethleffs is one of the major manufacturers of motorhomes and caravans worldwide. Dethleffs is a company of the Erwin Hymer Group. The Erwin Hymer Group unites leading motorhome and caravan manufacturers as well as motorhome and caravan accessory specialists, hire and financing services under one roof. The Group had a turnover of 2.1 billion euros in the 2016/17 financial year. It sold around 55,000 recreational vehicles and employs more than 6,000 people worldwide. The motorhome and caravan brands Buccaneer, Bürstner, Carado, Compass, Dethleffs, Elddis, Eriba, Etrusco, Hymer, Niesmann+Bischoff, Laika, LMC, Road-trek, Sunlight and Xplore, as well as Europe’s largest motorhome hire firm McRent and the motorhome hire companies Best Time RV und rent easy, and also the chassis specialist Goldschmitt, the accessories specialist Movera, the trailer tent manufacturer 3DOG camping and the touring portal freeontour all belong to the Erwin Hymer Group.